bentaz wrote: I have read about drilling into the back of projectiles to create sort of a minnie ball for using under size projectiles for rounds like the Carcano. The hot gasses cause the projectile to expand into the rifling. I can copy out whats in my book if you're interested to know more about the idea. I might try that with the lighter bullets as they don't have enough mass or bearing surface to seal the bore even with full-power loads. Anyone with any knowledge has to love the Mausers. Good luck shooting pigs with the 6.5 Carcano, the Italian army tried hard to replace that rifle with the 7.7 version after their Abyssinian campaign of the early 1930's the damn thing would not stop savages worth a damn. Mussolini thought it adequate, he not being one of the Grunts being put to the sword by an imperfectly perforated heathen. Then again someone apparently used one put two rds into John Kennedy's moving head at 250 yds ! Back 20 yrs odd someone with too much time and money chambered the cartridge in a modern bench gun, shooting modern bullets etc, there were articles in the Sporting Shooter, the project petered out at above 1/4 MOA which was a s**t result given the equipment and effort involved. All this is either hearsay or research, you decide but I reckon put a bayonet on the Carcano if you shoot it at a pig ! Back in the early '70's you could buy one for $25.00, that being maybe $26.00 more than they were worth LOL. Mussolini and his missus were beaten and hung from the front of a servo, not really a "Day of the Jackal" hit. Last edited by Tiger650 on 09 May 2017, 8:26 pm, edited 1 time in total. Tiger650 wrote: Anyone with any knowledge has to love the Mausers. I can't see too many pigs shaking off a 160gn RN at 2000fps - pretty much equivalent to the 30-30Win. I'm not interested in sub-MoA out of it, particularly as I won't be scoping it or shooting match bullets. 2MoA would be outstanding for an unscoped hunting rifle for use out to 175m on medium game. In '83 I paid $159 for my sporterised M96 and $99 for my all original M38 - both from Fullers. Skinny little Abyssinian heathen ****** needed a bigger hole put in them ! He was mostly a conscript probably and did not care about Il Duche's colonial ambitions, when confronted by the Brits in the Western Desert he threw down his Carcano and was treated decently, possibly ending up in Australia helping on a farm as a trustee. Hence lots of Wogs coming to Australia post WW2, good people too who work hard and do not want to kill me because I do not believe in their imaginary friend. Complete lies. I killed a pig with one when I was 12. A beautiful 140 gr Sierra boattail did the job. But I did say just one pig. You're a way off with your analysis of the 6.5 Carcano, firstly JFK was shot at 250 FEET, that is 83 yards. Ballistically the Carcano is more powerful than the 6.5 Mannlicher which has taken literally hundreds of elephant, so it is a capable round. The main problem from a military viewpoint is that the 160gn RN FMJ does not tumble upon impact and can often leave through and through wounds of small diameter that do not stop an adrenaline filled combatant. I agree the Italian soldier was a good fighting man but most lacked enthusiasm for their Fascist overlord, and was quite willing to chuck it in if he could. My late Father in Law fought them in Yugoslavia and he had great respect for the Alpine troops, but none at all for the plain conscript infantry. And despite post-war stereotyping one can also note that of the 5000 Division Folgore paratroopers in Nth Africa, only 294 survived, having stood their ground and fought to the last bullet. Modern Prvi ammo is loaded with 160gn SP, and will kill anything in Australia with good shot placement. Cheers. I found old Milsurp Carcano ammo, a box of 50 and a few random lose bags of cartridges at Melbourne Arms & Militaria Fair. 2. They do have Berdan primer. They are a mix bag of headstamps but all Italian (http://personal.stevens.edu/~gliberat/c ... story.html). Question, is it corrosive like the Mosin milsurp ammo? That is, do I need to scrub it for dear life after I shoot it? Pour a cup of boiling water through the barrel, all corrosive salts will wash away, clean rifle as per usual. Why you have some nickel and some copper is that all military cartridges were once nickel but cost considerations, among a few other reasons, made them change to copper. This is common with 303, where MkVI is nickel and MkVII can be found with both, and MkVIIz is only copper. Cheers. I was discussing the 6.5x52mm and went to Hornady for some data. They no longer list the .267" bullet - has it been discontinued perhaps? It doesn't work for me, but I know some people have found it works for them. I don't really want to get into this ****** about carcano's, their bullet's or Italians in general..........I have two Carcano's, one full length gain twist barrel and the other one, a carbine....not sure which one I'll use yet but I have a .264 barrel from a Swede and a 6.5x54 MS reamer so the idea is to cut off the x52 barrel and internally thread it, screw the 264 barrel into that and cut the new chamber.Cases are a bit more expensive but you can buy projectiles for it. The 6.5x54 MS has taken every thing from elephant down, if you do your part. yumastepside wrote: I don't really want to get into this ****** about carcano's, their bullet's or Italians in general..........I have two Carcano's, one full length gain twist barrel and the other one, a carbine....not sure which one I'll use yet but I have a .264 barrel from a Swede and a 6.5x54 MS reamer so the idea is to cut off the x52 barrel and internally thread it, screw the 264 barrel into that and cut the new chamber.Cases are a bit more expensive but you can buy projectiles for it. 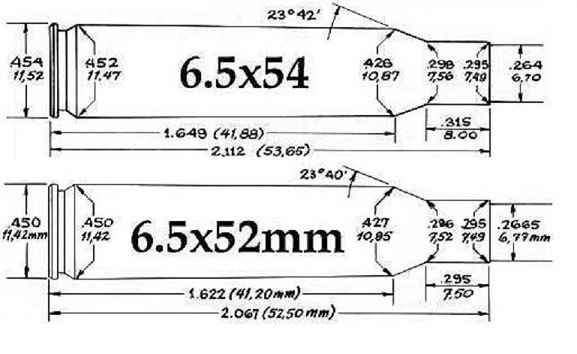 Why do you want to change to a different 6.5mm cartridge? Is your bore shot out? For me, the big deficit in the Carcano is the feed system, get rid of that and the rifle would be much more useful. The 6.5x52mm cartridge is not lacking, and the rifle is very enjoyable to shoot. 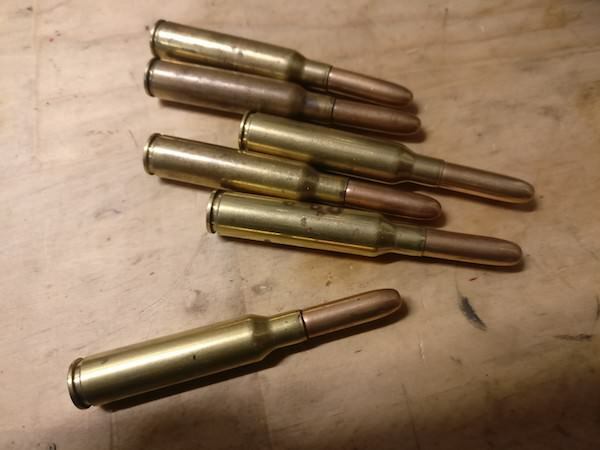 I made some 6.5x54R from .303 brass last night, just ran it into the 6.5x50mm die pushing the shoulder back until it chambered in the rifle. Had hoped to shoot them today but didn't manage it. The rifle came from a collector who caked everything in grease decades ago and never fired it. It took me a couple hours to strip it right down and scrub out the crud. The bolt was so packed with grease as to be virtually hydraulic. The muzzle is still tight at .266", but the throat is very long. 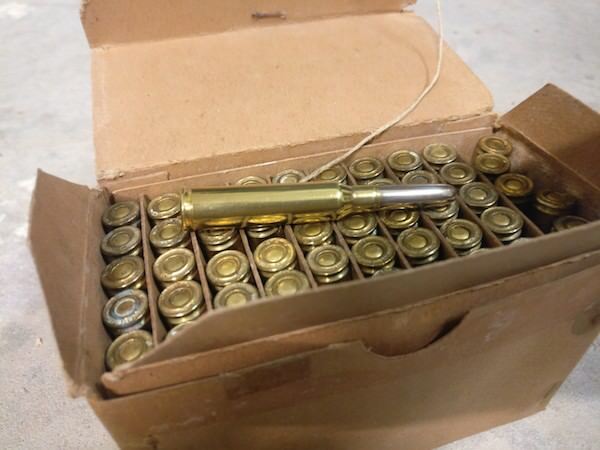 These are light loads with 95gn VMax's at 2.820" for fireforming the brass - they would touch the lands at 3.487". Even with the 160gn RN just seating into the trimmed case, the longest would be 3.155" overall, but the blunt bullet should be getting very close to the lands at that point. The brass chambers just fine without trimming but I thought it better to trim it, at least until I cast the chamber, so it might be possible to single-feed (like the Carcano, by removing the bolt, fitting the round to the bolt face and reinstalling it) for more accuracy. Mag length though is only around 3.000". I have no problem with either the Carcano or the 6.5x52 cartridge, nor are the barrels shot out in the two rifles. The main reason for the re-barrel is the availability of .264 projectiles.One rifle will remain in it's original calibre. I'm not sure whether we have crossed wires here or not, but I'm talking about the Mannlicher Schonauer 6.5x54, not the rimmed version. As the x54 will be a sporter, I will most likely convert it to a removeable box magazine so it can be scoped. yumastepside wrote: I have no problem with either the Carcano or the 6.5x52 cartridge, nor are the barrels shot out in the two rifles. The main reason for the re-barrel is the availability of .264 projectiles.One rifle will remain in it's original calibre. But if you are going to rebarrel it anyway, why not just cut a 6.5x52mm chamber in the new .264" barrel? Finally took some pics of my 1940 M91/38 Short Rifle. It's from FNA Brescia, but has a Birmingham BNP proof mark on the barrel and receiver - anybody know why that might be? Can anybody tell me what the "40-XVIII" mark indicates? 1940 perhaps? The folder is an unsharpened Atlanta Cutlery replica, the sling is a Chinese AK item.